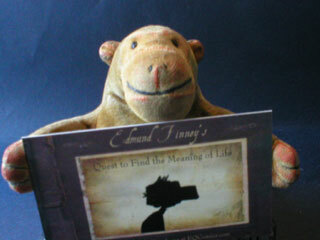 Mr Monkey frequently visits Edmund Finney's Quest to find the Meaning of Life to see comic strips depicting Mr Finney's latest adventures in search of the meaning of life. Recently the strip has dealt with the hunting of a rogue snowman accidentally created by Mr Finney, and a competition was announced. All that was needed was a picture of a conquered snowman. Mr Monkey thought he could manage that. 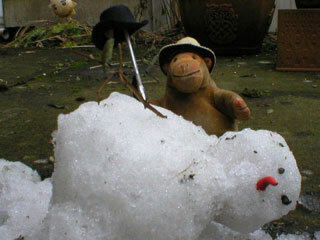 Mr Monkey sent Mr Rik outside to round up some snow and to make it look like a rampaging snowman. 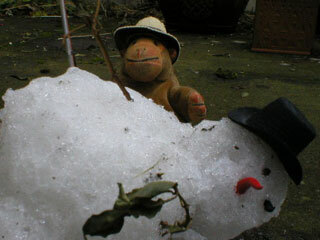 Sadly, rain had washed away most of the snow which had blanketed Mr Monkey's home for several weeks. Luckily Mr Rik was able to find a bucketful of slightly grubby snow and was able to fashion it into a mildly aggressive snowman. From some angles the fiend appeared to have three eyes in addition to its chilli pepper nose, which wasn't in any way deliberate. 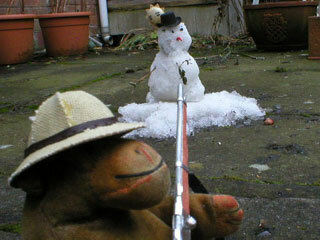 Mr Monkey donned his solar topee, borrowed a Lebel rifle from the Foreign Legion and set out to hunt the snowman as it rampaged (albeit in a not totally wide-ranging manner). The almost total absence of snow that wasn't the snowman did make the hunt slightly more easy than it would have been a few days earlier. A single well-aimed shot brought the savage beast down. Mr Monkey quickly scampered over to check that the snowman really was done for - he knew that merely wounding a savage snowman just annoys it and makes it more savage. This can be the most dangerous part of hunting a rogue snowman, as the creature could be playing possum to lure the hunter into range of its savage twiggy arms. He prodded the creature a couple of times, but got no reaction. Once Mr Monkey had confirmed that his aim had been true and that the fiendish snowman had been defeated, he took the evil creature's top hat as a trophy, and posed for a picture to be sent to Mr Edmund Finney. A shock awaited Mr Monkey the next morning, for the snowman had stolen away in the night leaving only a small damp patch on the flagstones. Mr Monkey may have had a close shave! Mr Monkey in no way condones the hunting of, or any attack upon, well-behaved and polite snowmen such as his seasonal companion Mr Snowman. Update : To the (joint) victor the spoils! 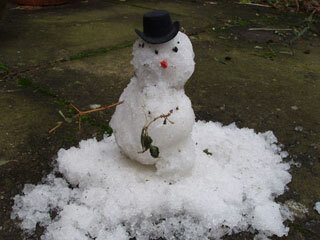 At the end of February Mr Monkey found out that he was one of the three winners of the Snowman Hunt competition. All the the winners and the honourable mentions are, of course, on display at the Edward Finney website. Some time later Mr Monkey received a package from the USA. He got it a little later than perhaps strictly necessary due to it being delivered under the garage door rather than via the more conventional letter box. 2. 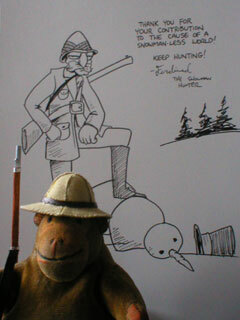 A picture of the snowman hunter signed by the snowman hunter himself. Mr Monkey was delighted by the print and the signed picture, though he was a little surprised to find out that the snowman hunter was called Ferdinand. For some reason he'd never thought of the hunter as being a Ferdinand. A Frederick, perhaps, or an Algernon, but not a Ferdinand. Mr Monkey also found that Mr Dan Long has one of the most excellent business cards ever.